Maximizer Stainless Steel - 2 1/2 in. Maximizer tubes are used to help extract the maximum amount of wort out of the bottom of your kettle by allowing you to draw liquid from below the height of the valve port. This size is normally used in boil kettles where it will stay out of the way of immersion chillers, and hot liquor tanks where there is no false bottom that could interfere. The 1/2" MPT threads on this Maximizer will thread in to the FPT threaded ports on the inside of any of our BrewBuilt or Heavy Duty kettles. Please note that these are too long to work in set ups with our domed false bottoms. Should work for what I need. Are there any flow restrictions with this when running a pump? BEST ANSWER: There are not any restrictions on my setup. I have it installed on a converted keg with a added valve on the side. I use a Chugger Pump to circulate wort thru kettle when cooling with no flow problems. I use this in my boil pot that I heat the water for my HLT. A March pump is then used to transfer the water to the HLT (cooler) wide open with no issues. I have not noticed any restriction using it with my pump. The tail is a little too long to thread into my kettle.... had to cut off an 1/8 inch to be able to use it. It’s too long and scrapes my kettle. 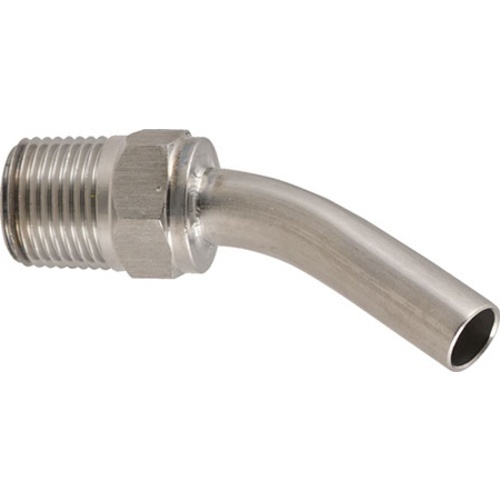 Great product - excellent weld quality and 1/2" diameter throughout for high flow rate. It would be nice to offer a shorter version for the Brewmaster kettles (at least the 18.5 gal). I cut ~3/8" off the tubing, but not everyone would have the tools to work with stainless. Added to a 10 gal BrewBuilt kettle and it does what its name says and allows you to get the most out of the kettle. I bought this to use in a keggle for making a boil kettle. The unit itself would work in flat bottomed pot, but it leaves about 2 gallons of wort in the bottom of a keggle. It is going to be used in the boil kettle and It has a very good throughput. I would recommend this to anyone with a flat bottomed kettle.